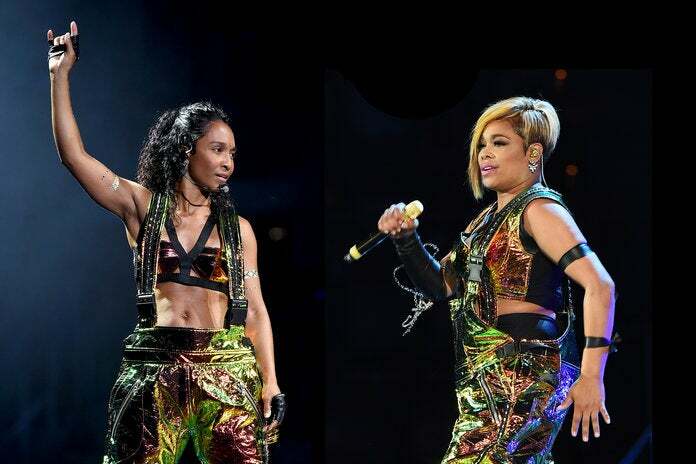 Chilli and T-Boz of TLC talk new music and iconic style. Let’s talk about teenage dreams. I had many. The biggest? Making out with Jonathan Taylor Thomas in my backyard and being about to sing “Pretty” with TLC because it was written FOR ME. I didn’t get to do either of those things, and it’s probably for the best, right? As most movies prove, the reality of fulfilling your dreams is never as good as you envision it being. Right? I may never have gotten to make out with J.T.T., but earlier this week, I had the insanely amazing experience of getting to hear TLC. sing “Pretty,” and three other hits in a warehouse space in London. Talk about dreams. And while I couldn’t show off my amazing vocal skills and sing with them, I did have the opportunity to speak with T-Boz and Chilli before they serenaded a truly chic crowd to celebrate Tiffany’s newest Hardwear collection. You guys have a new album coming out June 30 and it came about it the coolest way ever. You guys raised just under $500K on Kickstarter! Can you tell me what inspired it? T-Boz: That’s a loaded question. We’ll start with what inspired it. We haven’t made a studio album in a long time and through the years our fans have been [saying] over and over again, “Come out. Come back out. When are y’all coming back out?” It’s not like we haven’t wanted to. We were just doing other things, still working, touring, and all of that. And then when our manager told us about Kickstarter … we honestly were afraid at first. We were like, I don’t know about that. We were totally not on board. Chilli: But you know what, when he said the word ‘freedom’? That sparked our interest. And then we did it in a fun way, because the fans were able not only to help fund the album, but to get rewards. They got to go to the movies with us, we did personalized voicemails … We still have to do the sleepovers, which is coming. Just the fact that you’re able to do stuff like that if you’re a super fan, that’s really awesome. T-Boz: I just think the time presented itself. Time is everything, and the right time is now, and we did it in a new and innovative way. You guys have championed style and the ‘90s was your era. You always had your own look. How does your approach to music relate to your approach to style? Chilli: We can’t be tamed at all. We’ve never been that kind of group. We always used to talk about how our image was as big as our sound. People [don’t] only talk about our music but they talk about our clothes, our dances … Moving forward, it’s always pressure to figure out what is going to be that next thing that we want to do. Check out the rest of the interview on Instyle.com!